Equality as an aim in itself through government action is doomed not merely to defeat but to totalitarianism. I think that’s absolutely right, and when you look at some of the modern writings, the recent writings, by economists in this area, about inequality, they talk about the need for creating the circumstances to give greater equality of opportunity rather than equality necessarily of outcome. And when you look at some Christian theological writings – I’m thinking of Luke Bretherton’s book, which I know is part of what’s been behind this event – he talks about the need for hospitable generosity as part of the way in which we tackle inequalities, and I think those are important things. Equality can either be engineered and imposed by government diktat, or fostered organically in society through education and moral inculcation. The latter would be a more conservative approach; the former an essentially socialist construction – though there are many variations of these political philosophies and variable traditions of social theology within those strands. Discerning core dichotomies and mutual exclusions is not an easy task for the moral theologian (though it’s not an unusual episcopal pursuit in the realm of political philosophy). Consider ++Justin’s first sentence. 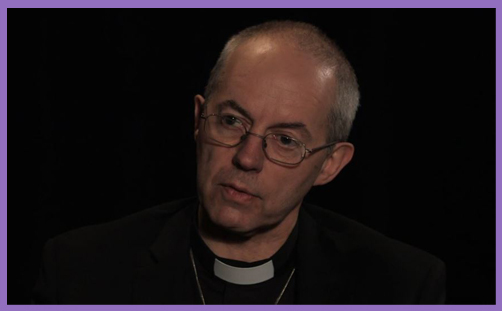 While all the main Westminster parties are legislating to prohibit all forms of discrimination and enshrine in law certain ‘protected characteristics’, the Archbishop of Canterbury grasps that the equality of man and man and man and woman arises not from Parliament, but from the transformed hearts and minds of man. Attitudes are not modified by statute, but by consideration of and sensitivity to the social community: inequality and injustice must first be apprehended in the hearts and minds of men before society may be transformed. Government action does not make the unequal equal: the starting point is the acknowledgment of the equality of all men before God – a belief which stems fundamentally from a Protestant reading of Scripture. Equality as a political vision and civil imperative inclines toward totalitarian injustice because it denies liberty to difference. We may share and be required to share, but we do not all need equal portions because some differences cannot be overcome. If a man does not have legs, he cannot walk. If he has no tongue, he cannot articulate. If he posseses no breasts, he cannot suckle progeny. If he is a socio-biological castrato, he cannot procreate. Baptismal egalitarianism is the acceptance of natural diversity: differences are not all to be levelled in the political realm or overcome in the economic realm, but accepted, affirmed and celebrated. There is, in Christ, neither Jew nor Greek; slave nor free; male nor female. Neither is there young nor old; married nor single; disabled nor able-bodied. But in Christ there are prophets and deacons, healers and teachers, cleaners and flower-arrangers. And, like it or not, prophecy is better than tongues. All are worthy of respect, but the head ought not to be treated like the big toe: some parts of the body are simply more worthy of honour than others, and that is natural law. A government that insists that the toe is no different from the head pursues a fundamentally unnatural vision of society. Human solidarity is not realised by minority self-assertion, coercion or violence, but by the apprehension of the equality of sin and the inequality of guilt. Moral difference is part of our brotherhood and sisterhood, and the only egalitarian principle that ought to be pursued by government is equal justice. Anything else is in danger of becoming idolatrous – even the pursuit of democracy itself. The egalitarianism advocated by Archbishop Justin is implied by the baptismal conservatism of One Body and the socialism of the Eucharist. They are both concerned with the need to love, forgive, share and accept. Government aims may become idolatrous and the ruling powers tyrannical when the state demands loyalty to an oppressive orthodoxy. The Archbishop of Canterbury prefers to see a society determined by equality of opportunity rather than equality of outcome; and through the exercise of incrementally-changing conventions rather than revolutionary pretensions of ideology. This does not make the Archbishop a Tory, but it does suggest a conservative inclination toward good government. So, instead of bashing him at every turn and straining over every jot and tittle of the broadsheet snippets and terse tweets which swarm around every speech and sermon he delivers, consider that they are not and cannot be the sum total of his theological beliefs or his philosophical worldview. His grasp of the politics of equality is far more profound than many of the shiny new things currently sitting on the green benches. Our grasp of his grasp of equality is helped if we experience the Exodus and Pentecost together.